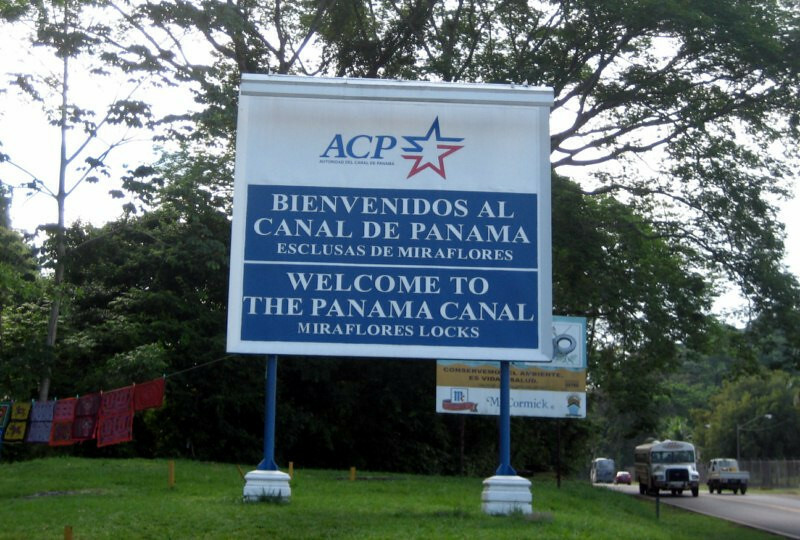 Into Panama City to see the canal and onwards south to the end of the Pan-Am in Central America at Yaviza in the Darien. 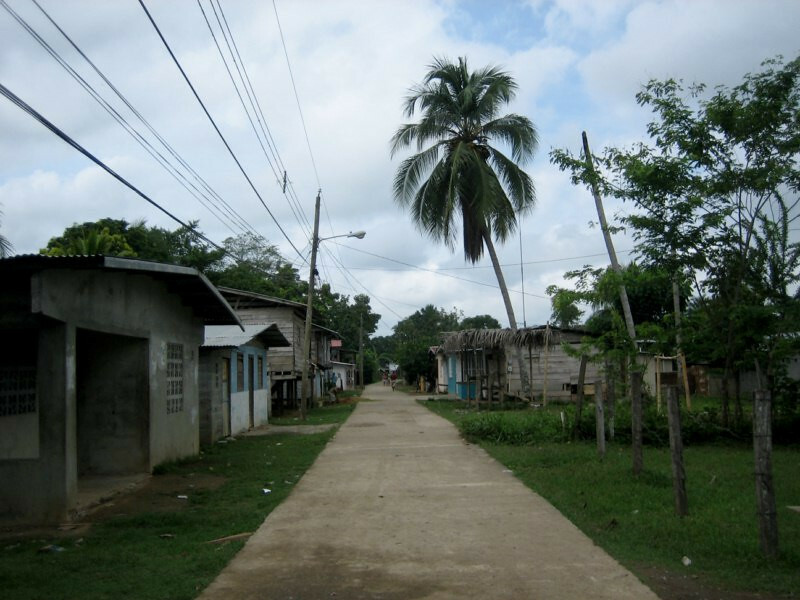 After a nice two days in Chitré, I continued on south to Panama City. 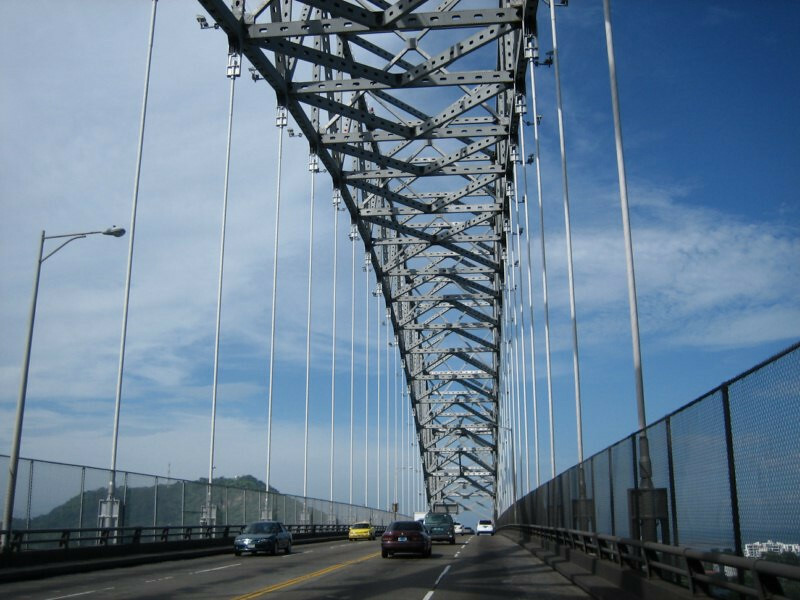 Crossing the Bridge of the Americas (Puente de las Américas) as it goes over the Pacific entrance to the Panama Canal. 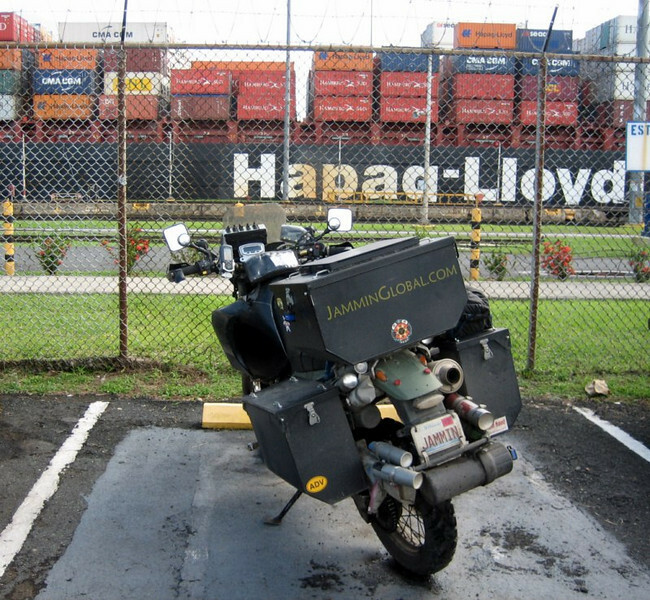 Riding alongside the Panama Canal Railway, which was built in 1855 in response to the Gold Rush in California and the numerous people traversing from the East Coast of the US to California, avoiding the wild interior. They took ships down to Panama, crossed the 50 mile isthmus and sailed onward to California. 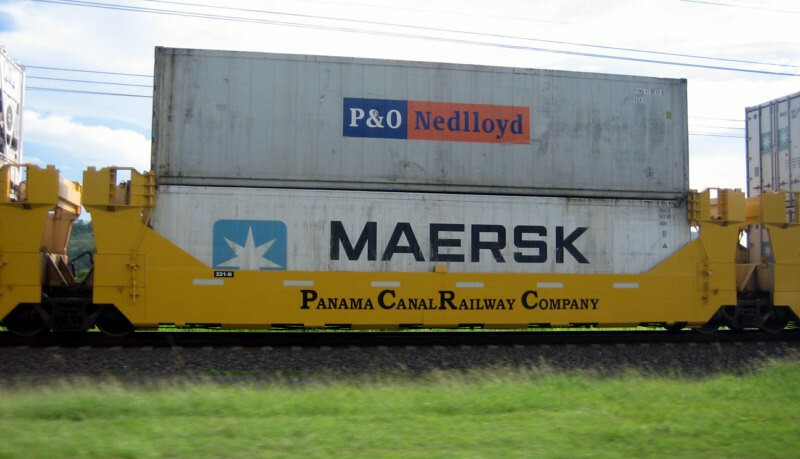 The railroad was also pivotal in Panama being chosen for the canal as it greatly helped during construction in hauling equipment in and debris out. 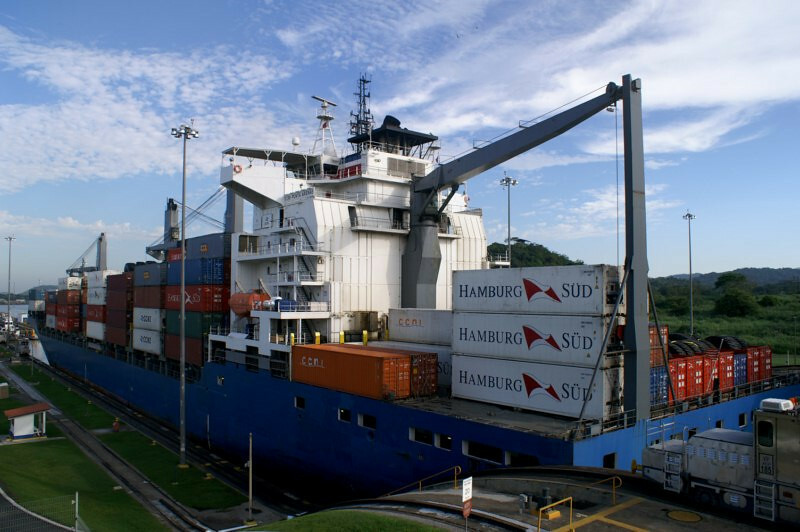 Today, it helps transfer cargo from one side to the other in addition to ships traversing the canal. 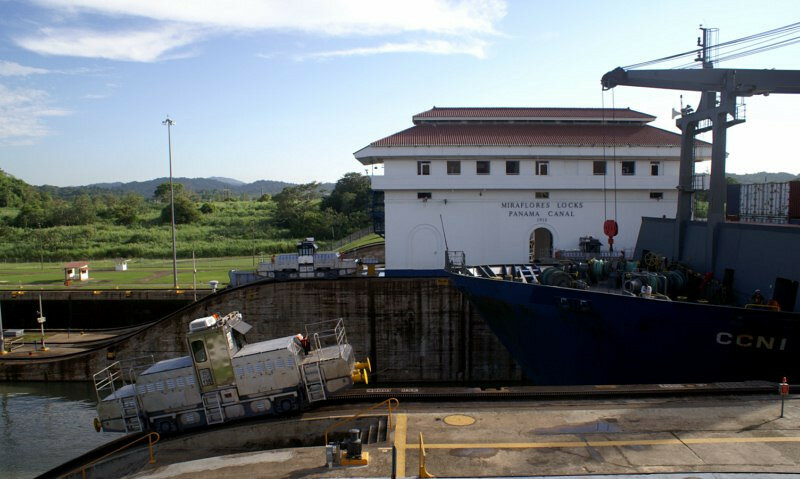 The first of three locks in the Panama Canal, Miraflores. 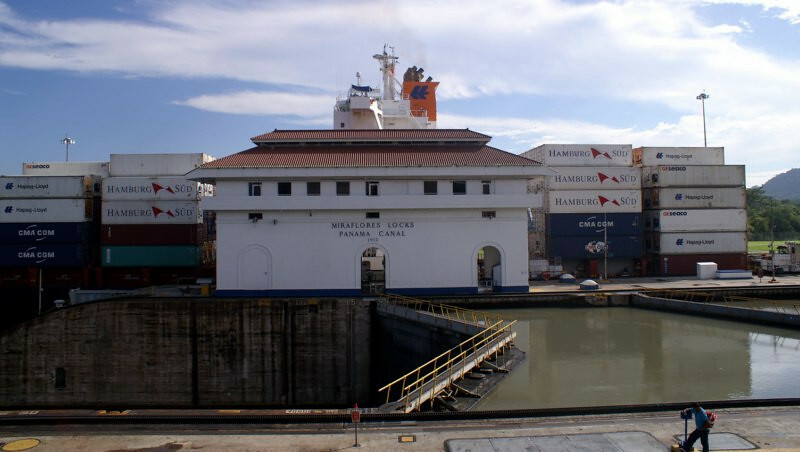 sanDRina at the Miraflores Locks in the Panama Canal with a Hapag-Llyod Panamax cargo ship traversing the lock. 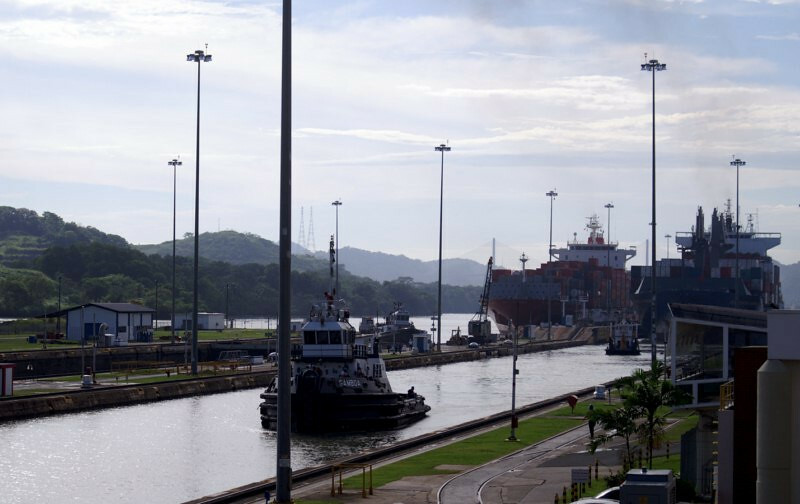 Miraflores Locks at the Panama Canal with a cargo ship in the far lock. 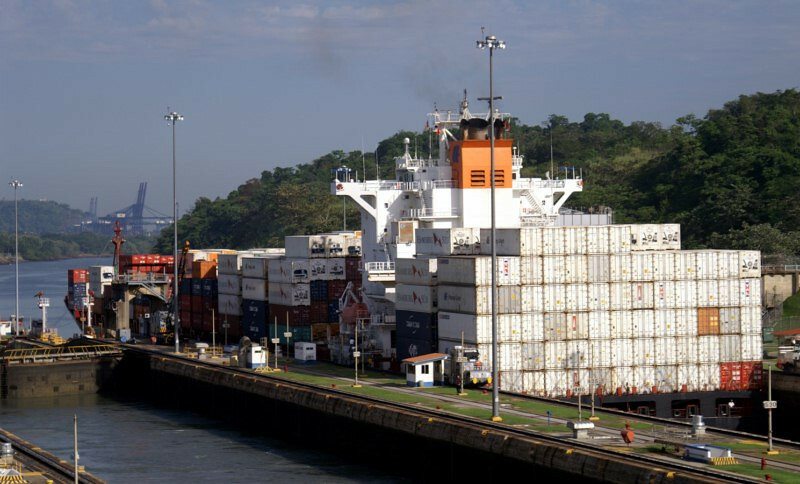 The Panama Canal was constructed to reduce shipping times from the Atlantic Ocean to the Pacific Ocean, saving around 13,000 kms (8,125 miles) of going around Cape Horn. 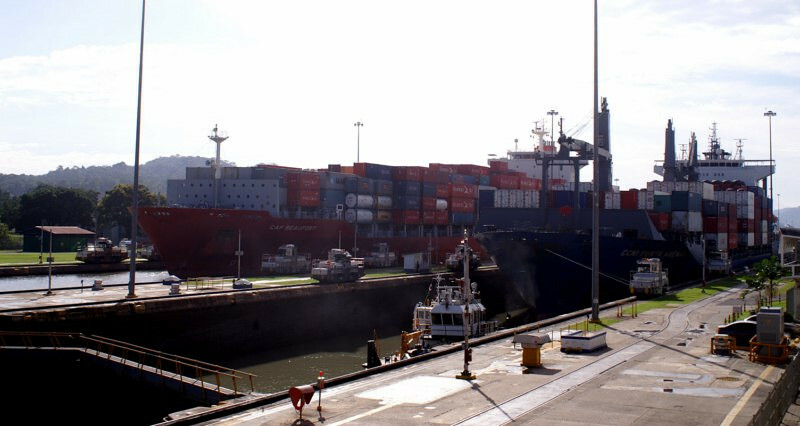 It costs about $100,000 per transit of the canal for big cargo ships compared to around $1 million that would be spent in fuel and other costs to go around Cape Horn. 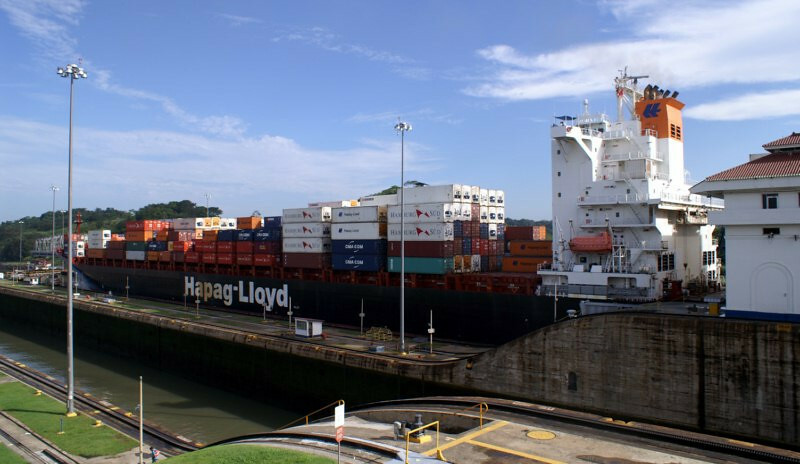 The Hapag-Lloyd Panamax cargo ship at the last lock before reaching the Pacific Ocean. Instead of cutting straight through the continental divide, which the French tried initially when they started building the canal in 1880, the American design uses locks and dams to raise ships to an altitude of 26 m (86 ft) before dropping them back to sea level. Slowly being lowered as the water level drops in the lock. 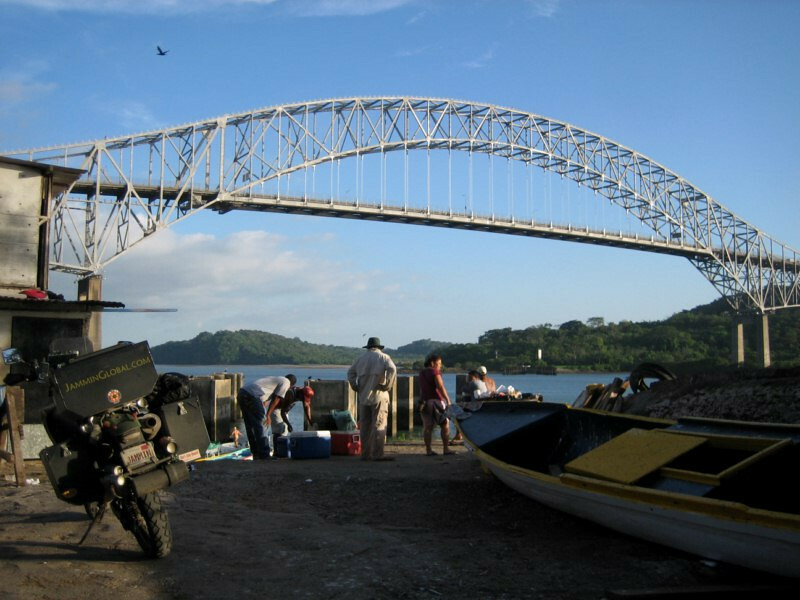 Panama was originally a state in Colombia and the US helped bring about independence to Panama in 1903 so that they could construct and operate the canal, which they did till 1999 when they turned over the operation to Panama. Two more Panamax cargo ships coming through. 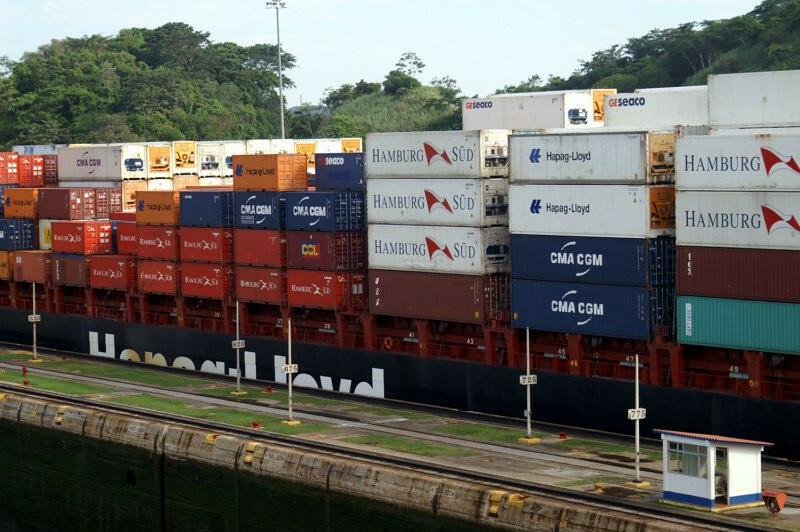 Panamax is a designation for the maximum allowed dimensions of a ship that is allowed to pass through the locks of the Panama Canal. 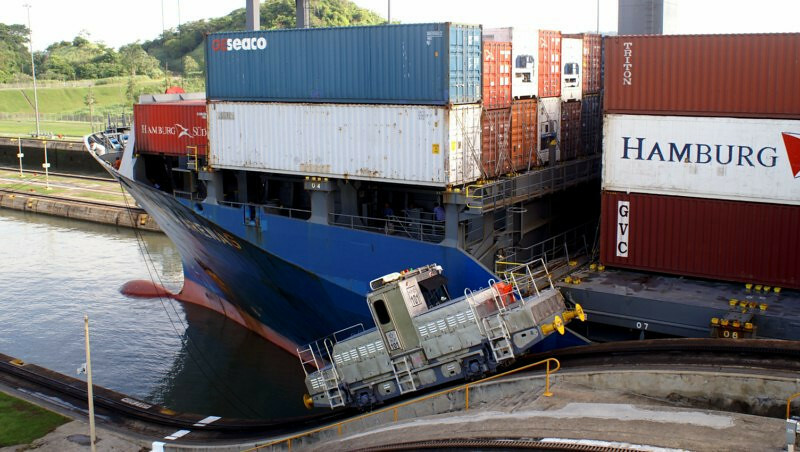 Ships are designed specifically to fit through the locks. Supertankers that are much wider and longer than the locks are referred to as Post Panamax. The water is pumped from the top lock to the bottom lock (note the first ship is almost level with the ocean surface now). Being released into the Pacific Ocean. Look at that thing, it’s 13 semi-trucks wide! Each time a lock is opened, 101,000 cubic meters (26.7 million gallons) of fresh water is released into the ocean. Seeing the wastefulness of this, the canal authority in cooperation with the World Business Council for Sustainable Development has designed into their future expansion water-saving basins at each lock that will reuse 60% of the water in each transit. The next ship being lowered as the water level equalizes. …and the ship is tugged through to the next lock. The electric tug trains cost $2 million each and about 6-8 of them are used on each ship to help stabilize it thru the lock. 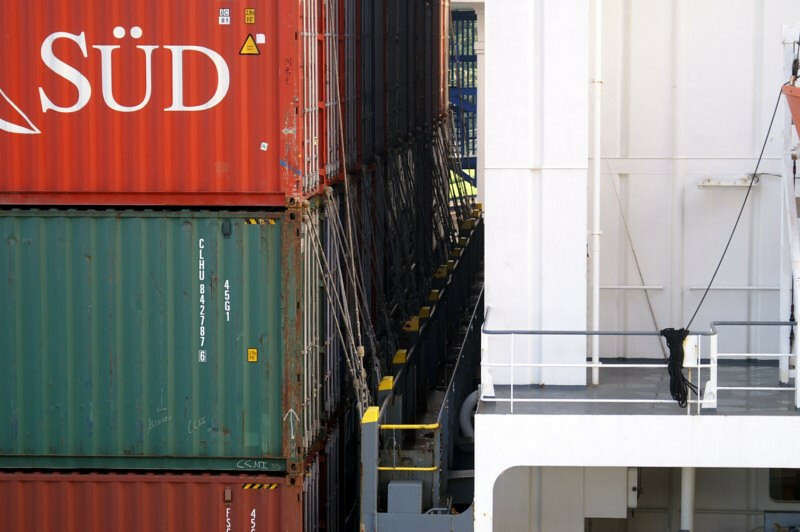 There’s only 2 ft of clearance on each side of Panamax ships. Heading down to the last lock. 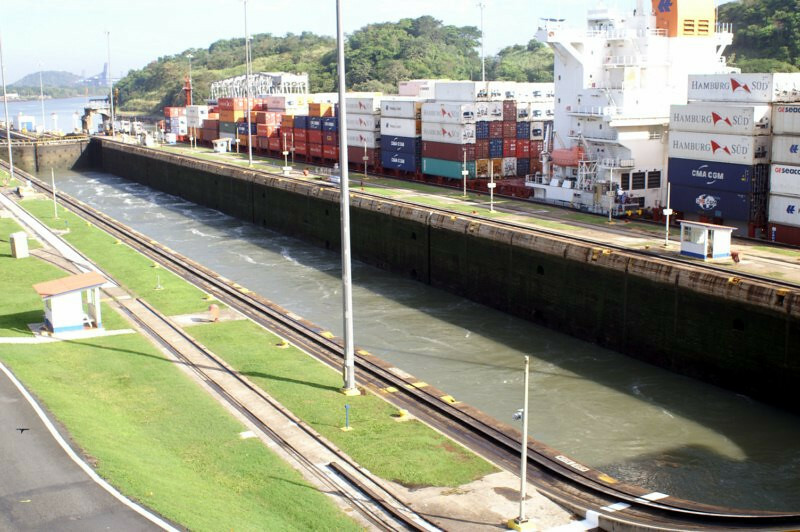 It takes about 10 hours for a ship to transit the whole canal. The containers securely tied down. The Panamax CCNI Punta Arenas, heading to Chile. Biggest users of the canal are the US, China and Chile. Most impressive to see this engineering marvel in person, paying respect to the thousands of workers who lost their lives in its construction. 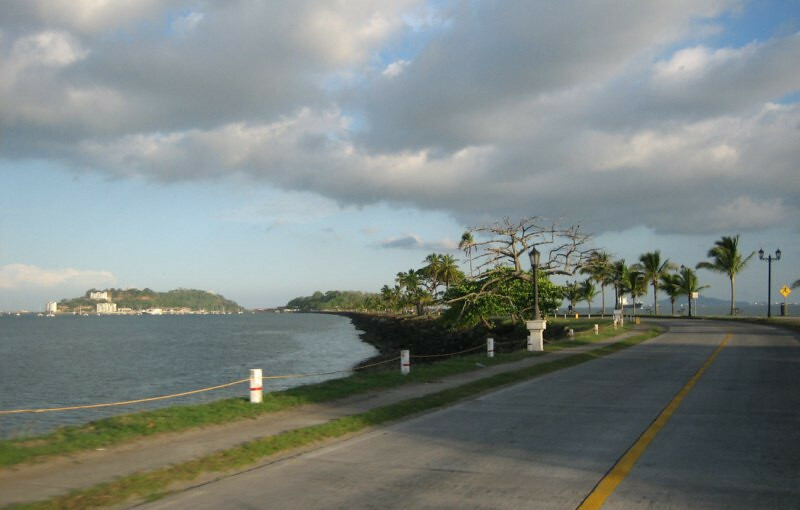 Heading down the Calzada de Amador (Causeway), which juts out into the ocean for about 3 kms. It was constructed by the debris from the canal. 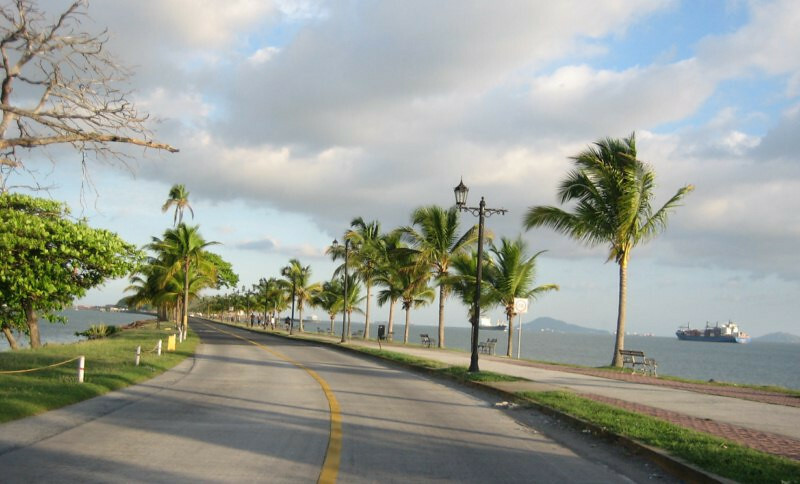 It’s a pleasant drive with space for jogging and bicycling; popular with residents and tourists. Note the ship on the right side, it was the first one I saw through the canal. 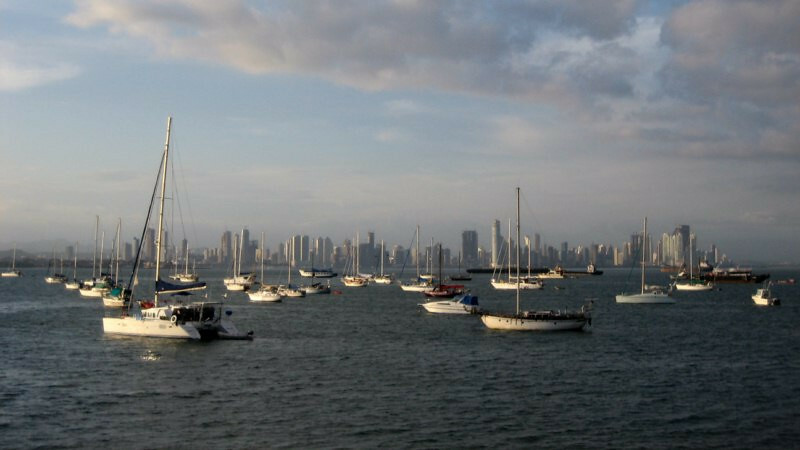 Panama City skyline from the islands in Panama Bay. Heading back into the city with a view of the Puente de las Américas. 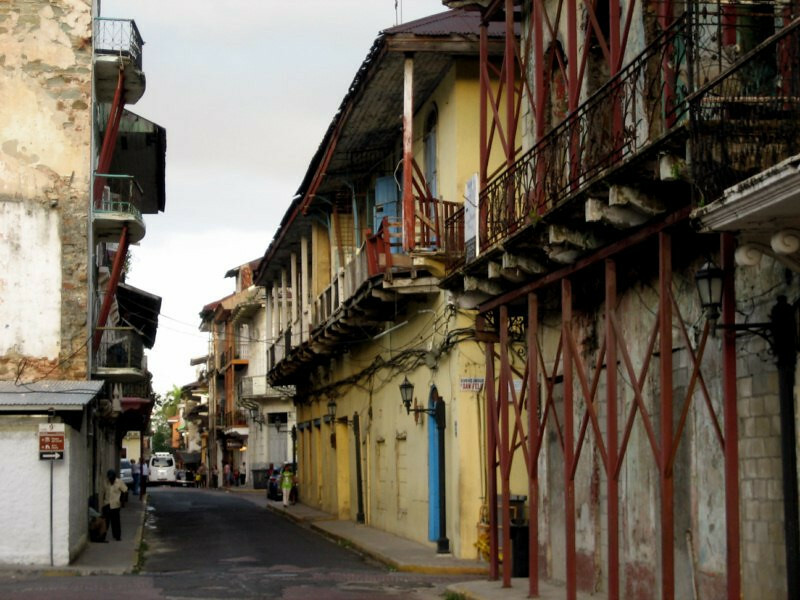 Casco Viejo, the old town in Panama City. It’s a bit run down, but it’s being slowly restored. 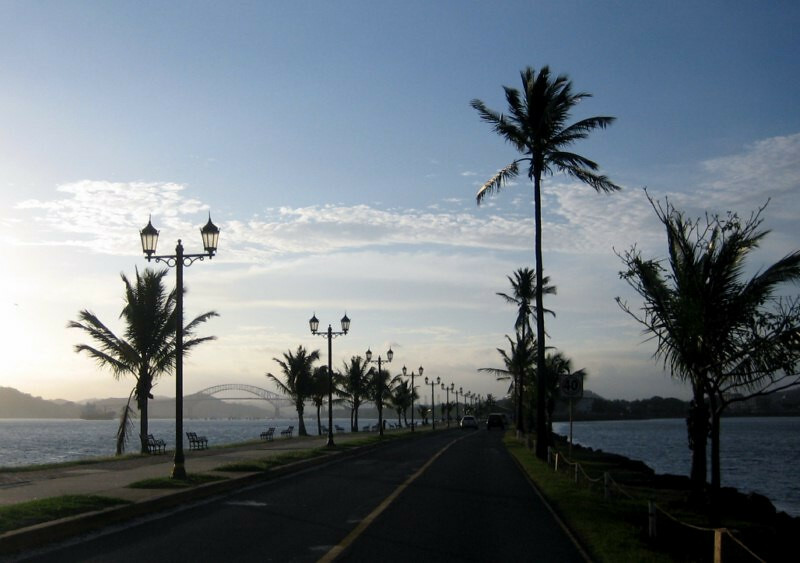 Before construction on the Panama Canal began, all of Panama City was in Casco Viejo. 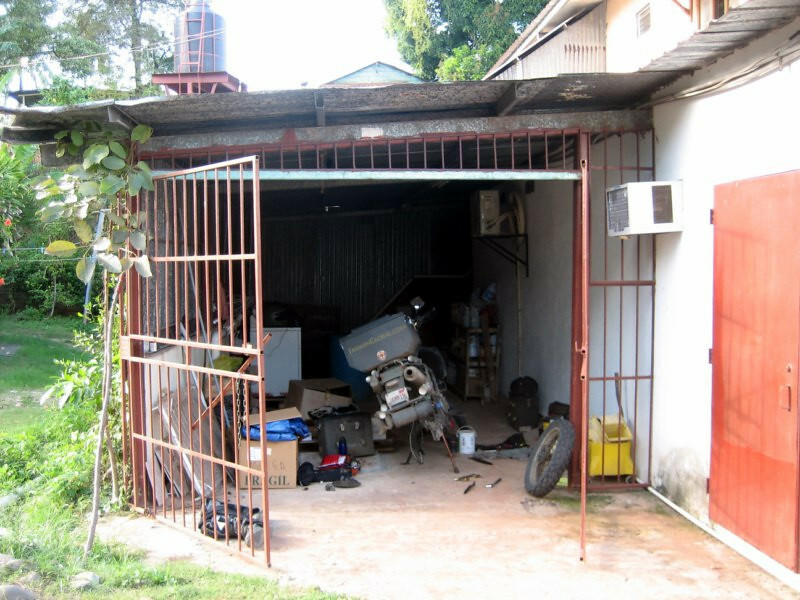 It was abandoned for the new city as economic expansion dictated more real estate. 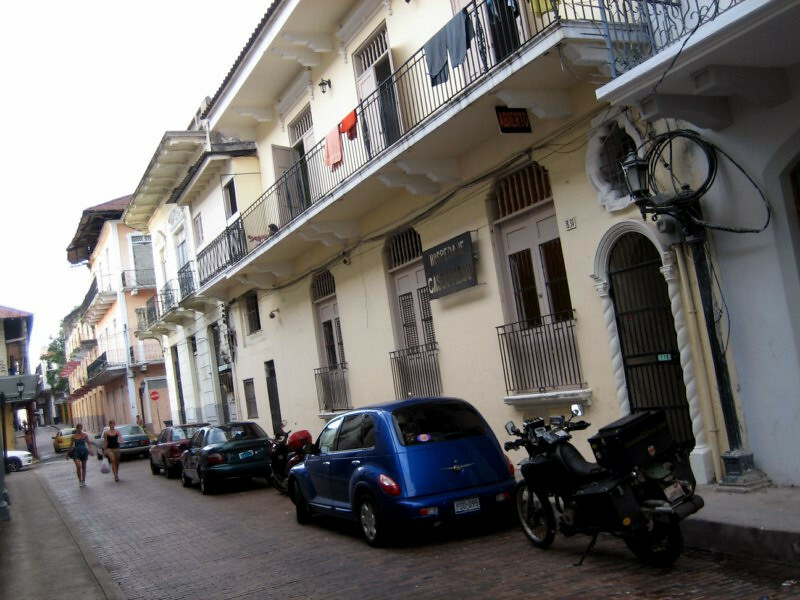 Staying at Hospedaje Casco Viejo for $10. My first backpacker hostel of the trip. The area was considered dodgy a few years ago, but it’s quite safe nowadays. 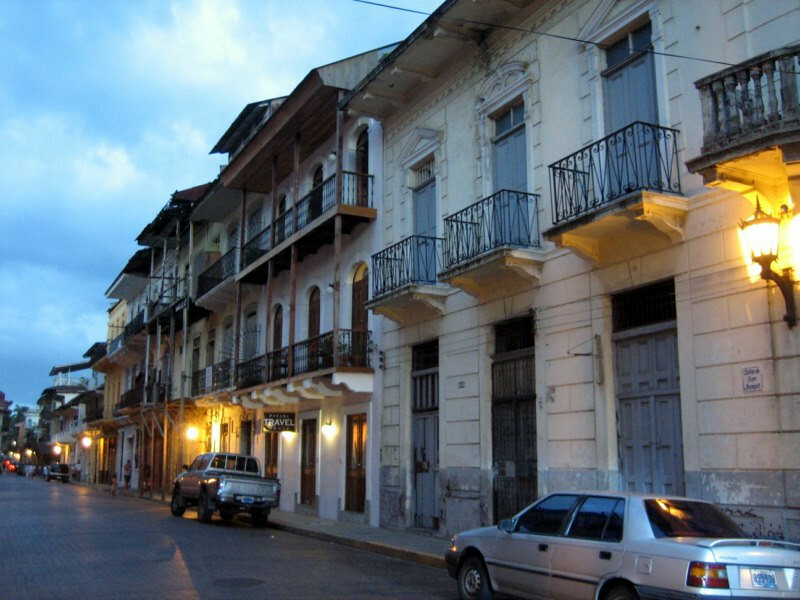 Casco Viejo was recognized as a UNESCO World Heritage Site in 2003 and its restoration continues. 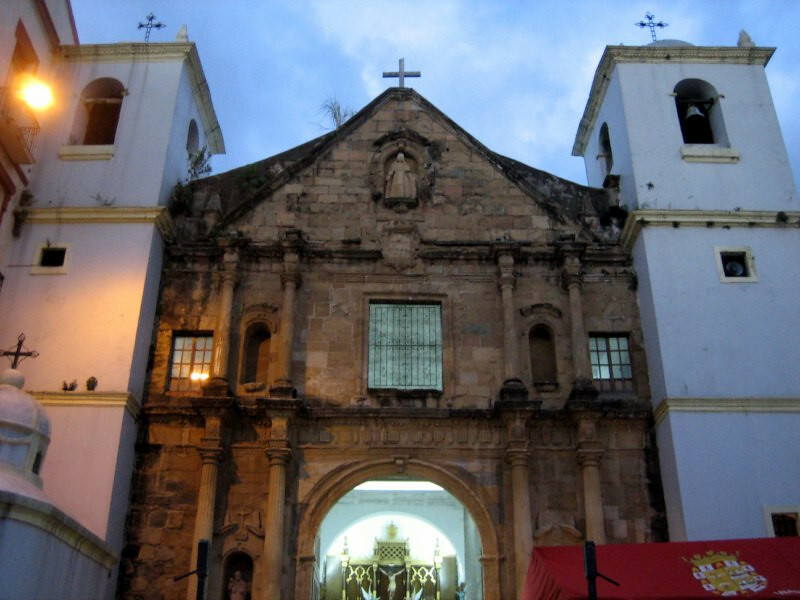 Iglesia de La Merced, an old church still active with service. It looks like new construction was built to support the old facade. 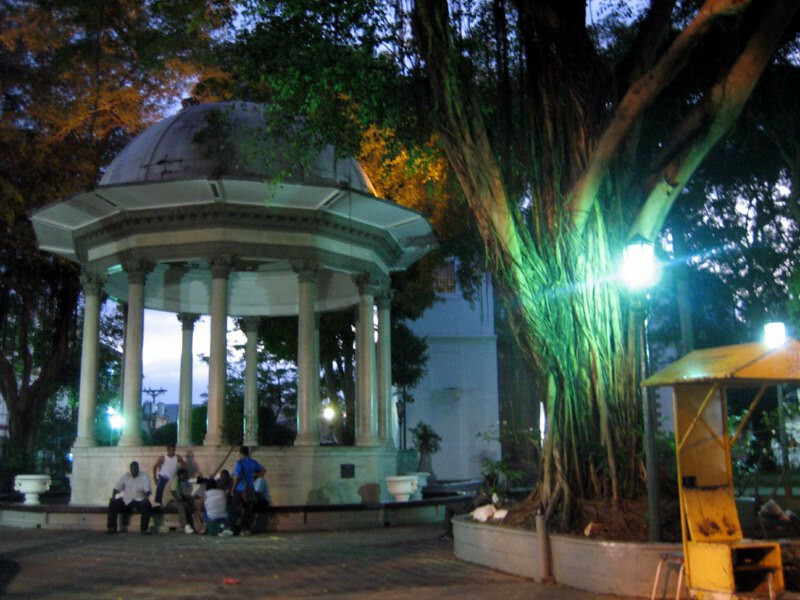 Parque Herrera at sunset. Lots of locals were milling about and the place was very active. Coming across a restaurant, run by Chinese with good looking food in the display window and approval from exiting locals. 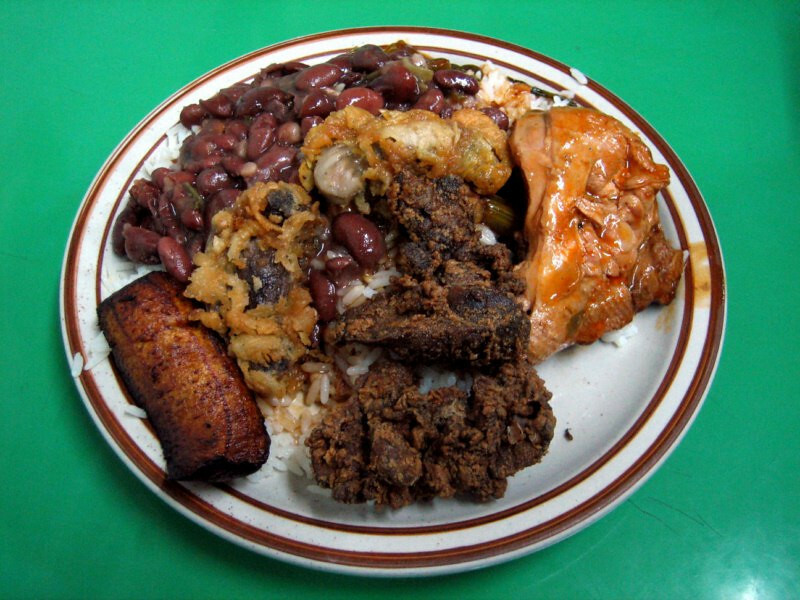 Rice and beans with chicken in a sauce and fried plantain and special sides of fried chicken gizzards and liver. Mmm, mmm, good. I’ve been craving me some gizzards. Cost $2.70. 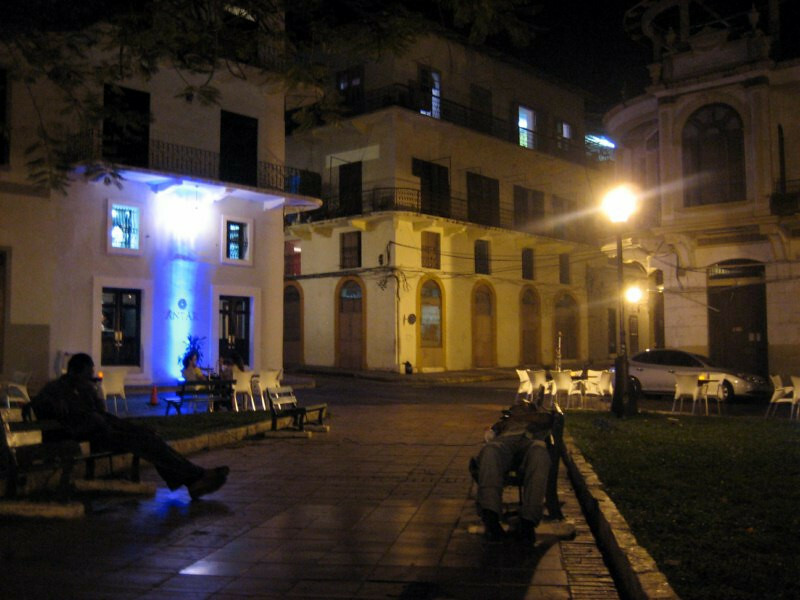 Walking back to the hostel I came across this small plaza where the chic outdoor restaurant in the corner was piping beautiful jazz music and I just had to sit down and soak it in with the fresh evening breeze and clear night skies up above. 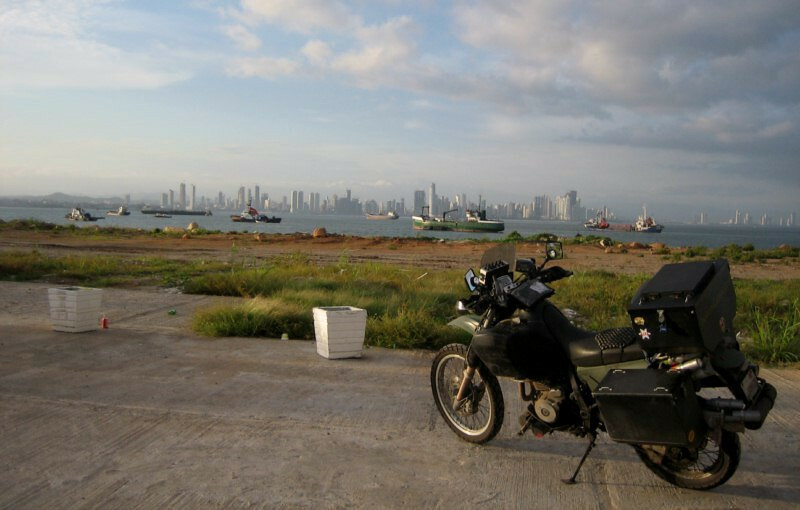 With one day left to catch my boat to Colombia, I decided to head out early to get to Yaviza, the town at the end of the Pan-American highway in Central America. 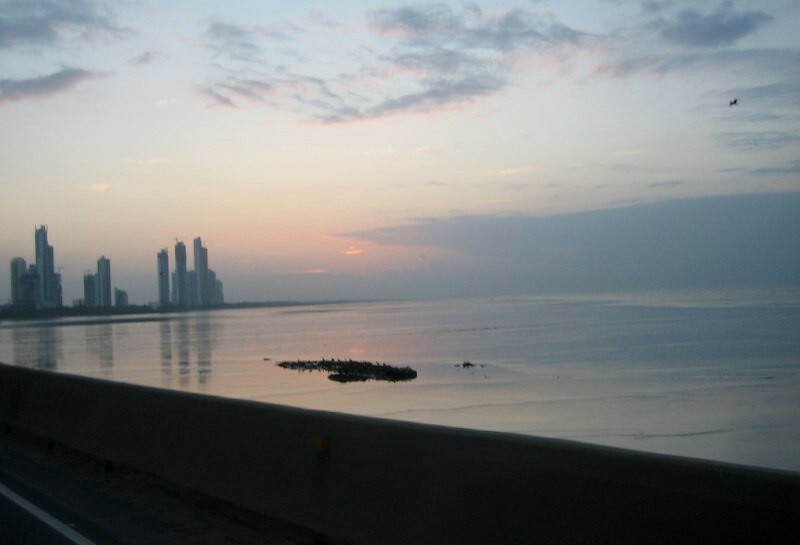 Catching a nice sunrise over the eastern part of Panama City. 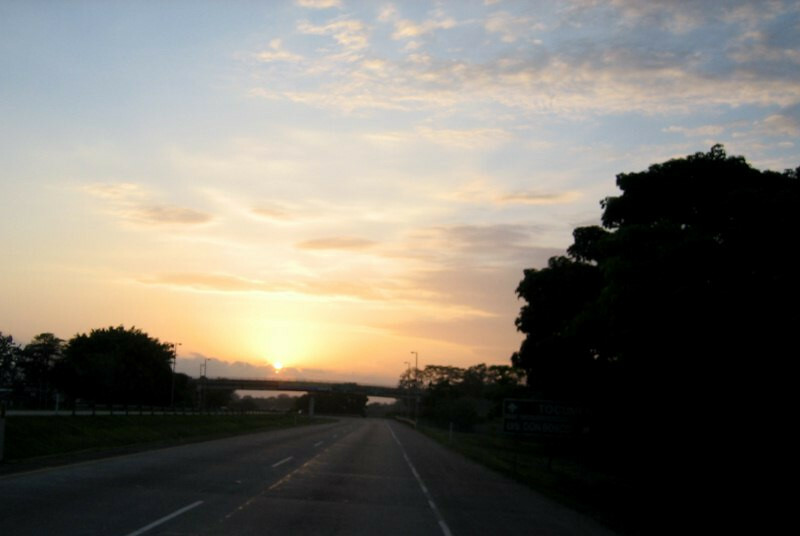 The southern corridor road cuts across the bay and is tolled. Heading towards Tocumen with the sun breaking through. 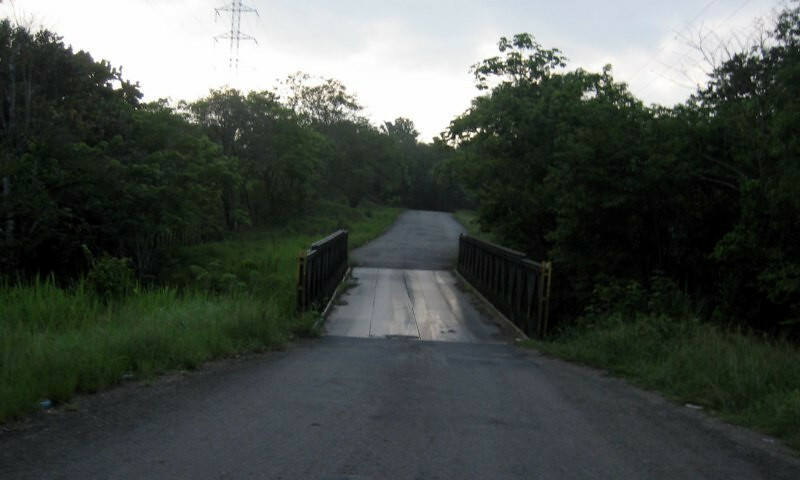 After Chepo, the road gets smaller and there were numerous one-lane bridges with sheet metal coverings; slippery when wet. This ride was quite a challenge a few years ago when it was unpaved, but now it’s a leisurely paved ride. But the scenery is still nice and there’s some twisties here and there. 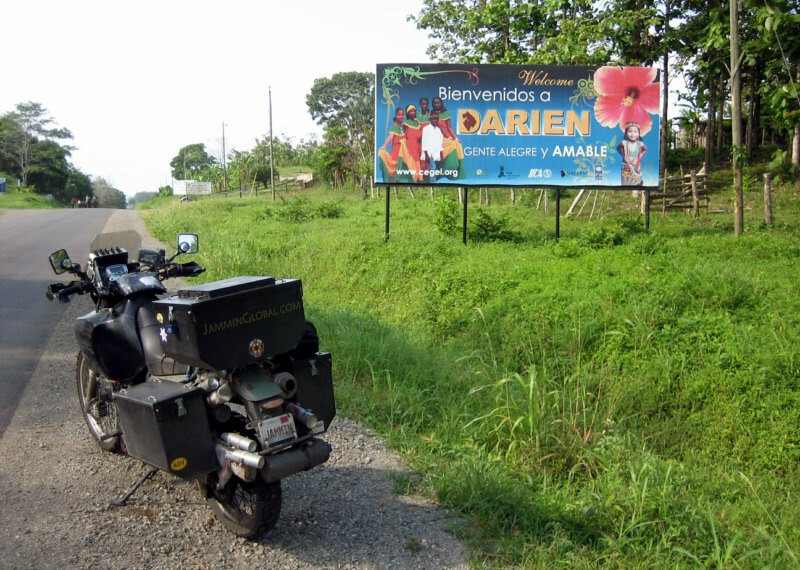 Welcome to Darien, the famous remote province of Panama with less than three people per square kilometer. It’s a UNESCO World Heritage site for its primeval landscape, which hasn’t changed much in a million years due to lack of development. Surprisingly all these trees haven’t been felled by loggers and it feels good to ride under the shadow of such lush forests. 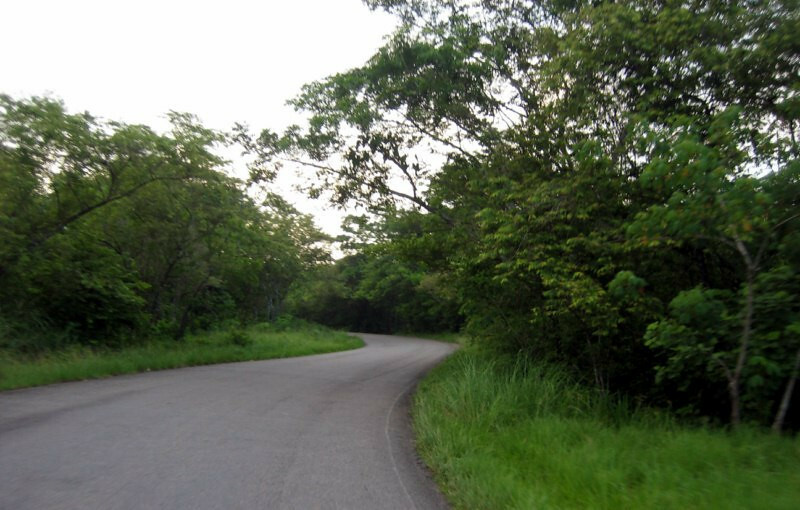 The scenery changes a bit (less trees around) as you get near Yaviza and the road gets twistier. 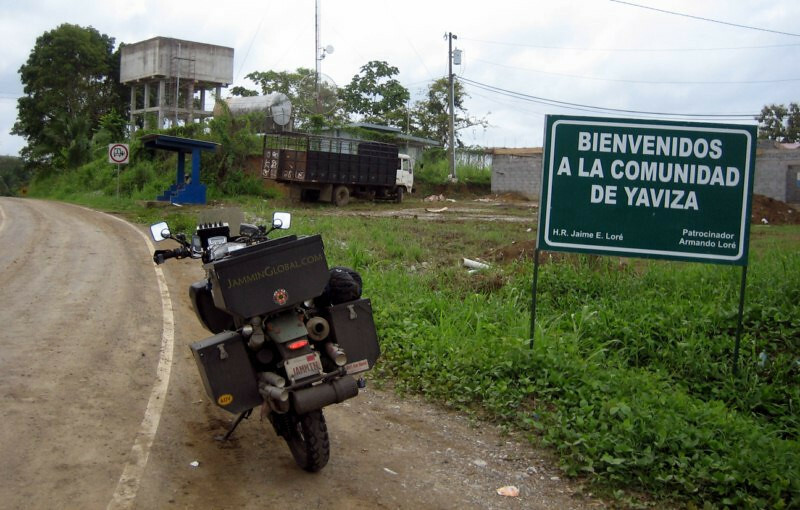 Welcome to Yaviza, the last town on the Pan-American highway until Colombia. 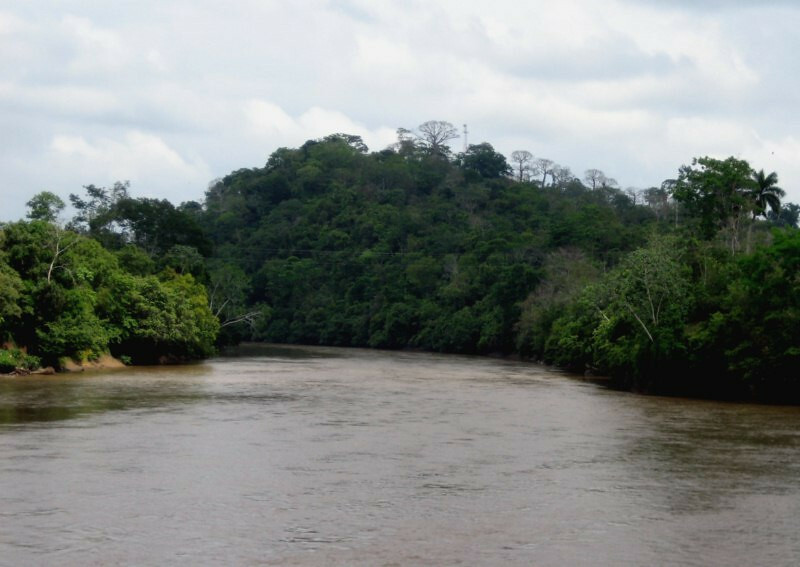 The reason they haven’t connected the road to the Pan-Am in Colombia is mainly because of the tough jungle terrain with lots of rivers and swamps to cross. 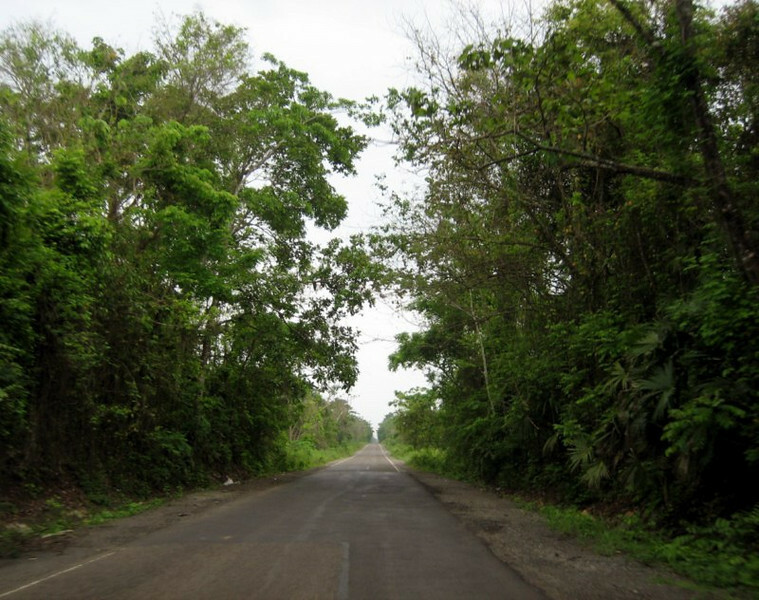 I’m sure they could if they really wanted to and might at some point in the future, but for now, there is no intention to connect the road as it would destroy a lot of virgin forest and might spill over the fighting from Colombia into Panama and could ease drug smuggling. 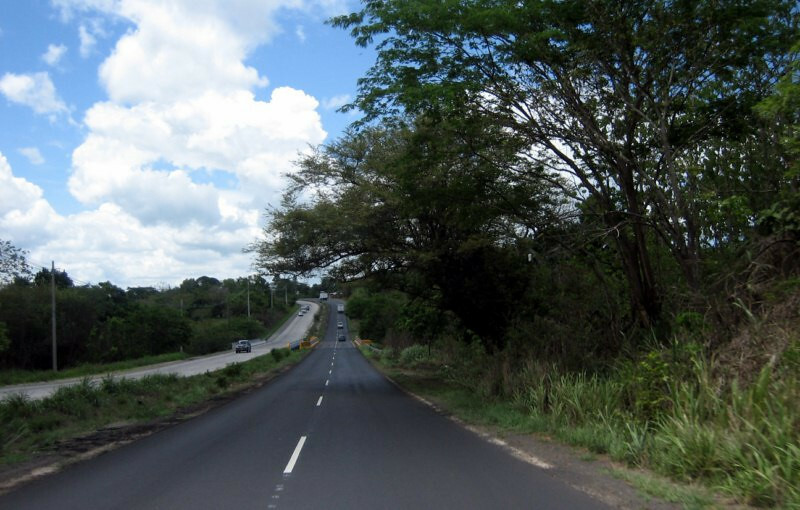 The Pan-Am just ends into this single lane concrete road as it circles around the township. There are military guards all through the Darien and they take down your passport details in case something goes wrong. 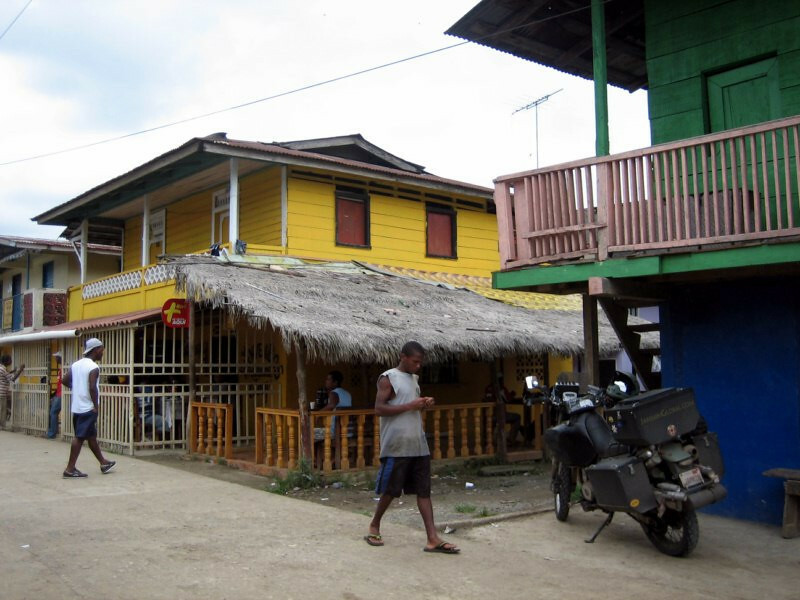 Once you enter Yaviza, you’re directed to go check in at the local police station and have to tell them what your intentions are (staying the night, just having lunch, etc). This could be considered the symbolic end of the road as the Darien continues on the other side of this bridge. 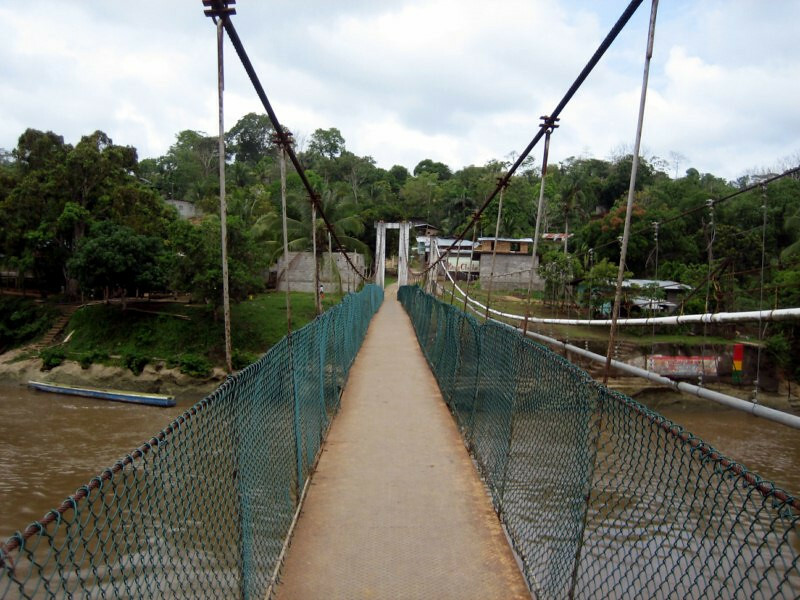 People have crossed the Darien Gap overland into Colombia, but it’s a serious expedition. 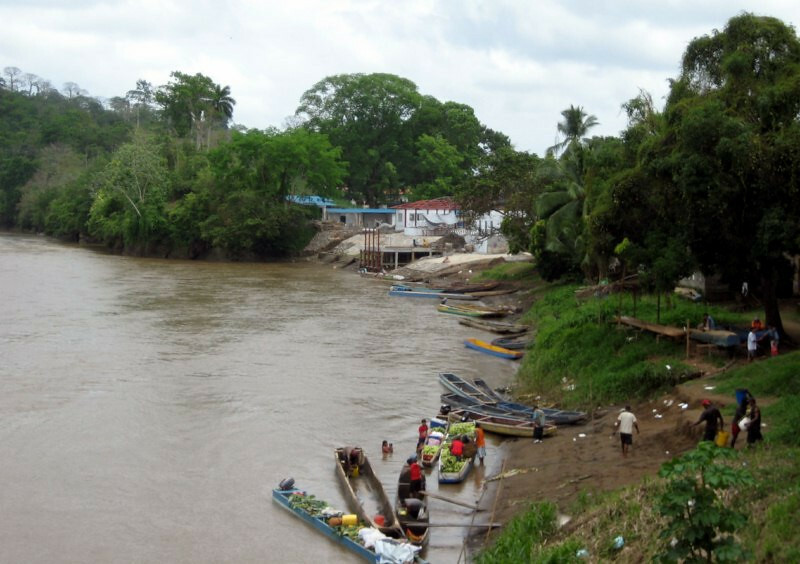 Locals pulling ashore with plantains to sell. You can get a taste of what lies ahead in the jungle. Colombia is just about 150 kms away. 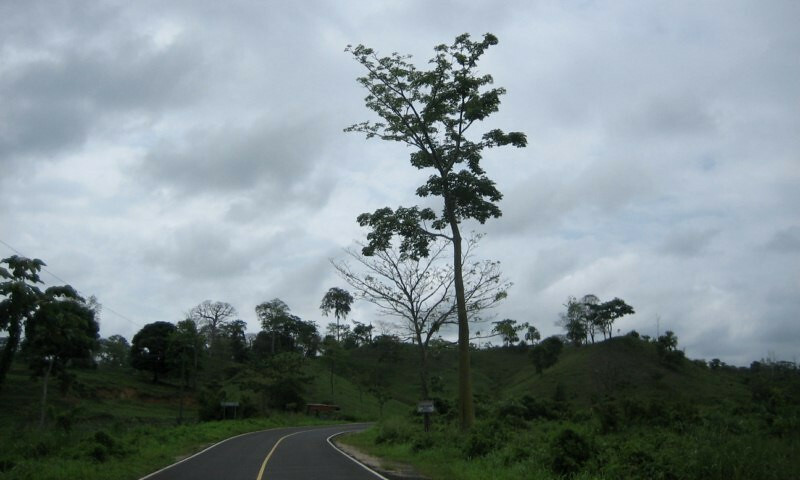 I’m happy that there’s a gap here as it adds a bit of excitement in getting to Colombia. Having lunch at a decent looking restaurant in Yaviza. There were lots of locals about, but not unsafe in anyway. 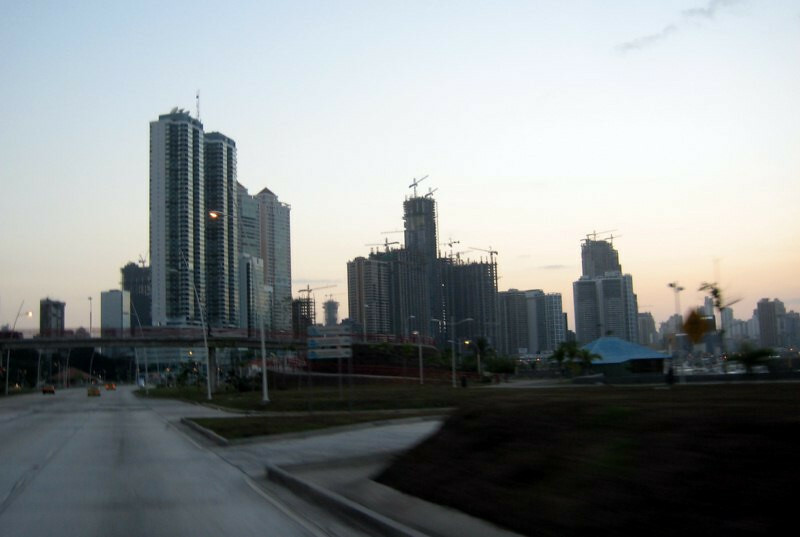 Having left Panama City at 6 am, I got to Yaviza by 10:30. 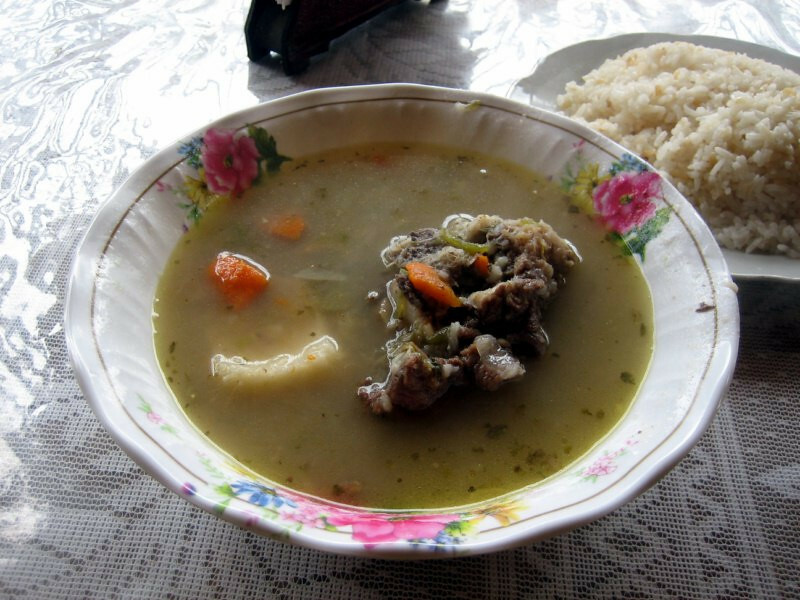 Having sancocho, a typical food around the whole of Panama, basically a soup with some meat and cassava. This one was with goat meat. Cost $1.50. 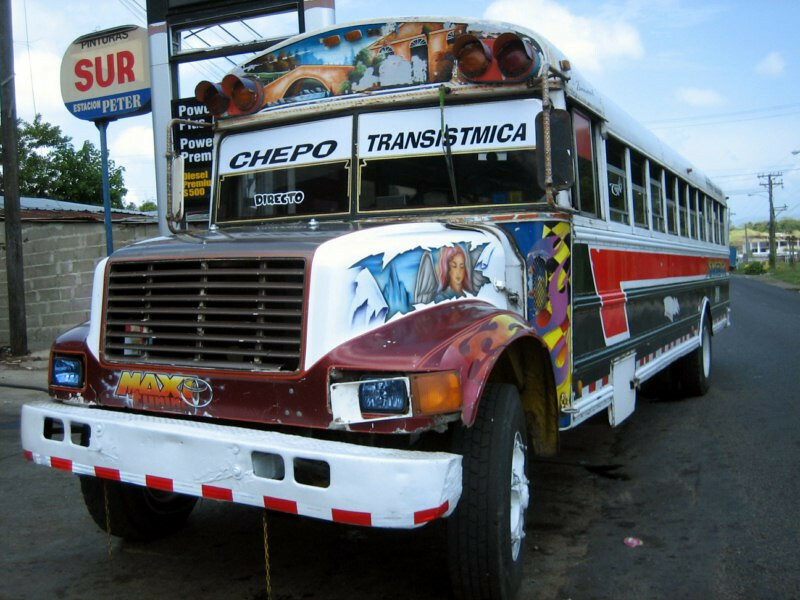 The colorful public transportation of Central America. All through these countries, the buses, usually old American school buses are decorated and painted in wild colors. This isn’t the best example, but this was the last one I would be seeing so had to snag a pic of it. 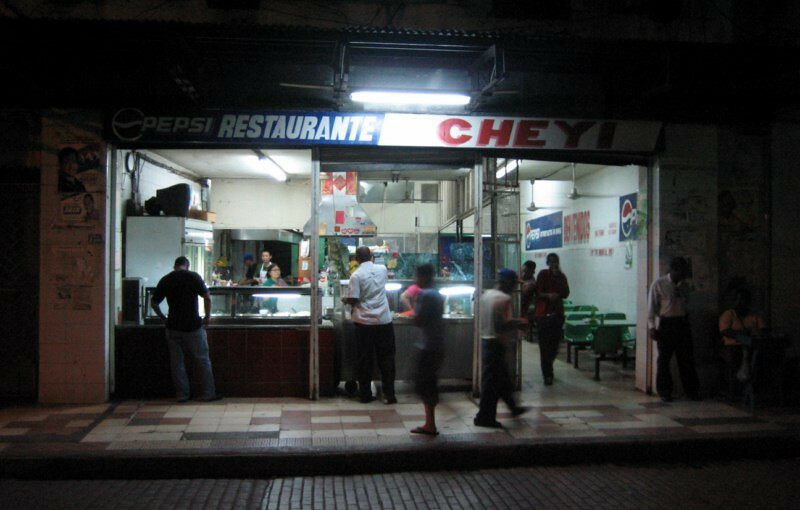 Made it back from Yaviza to the town of Chepo. Last night in Central America, boarding the boat tomorrow. 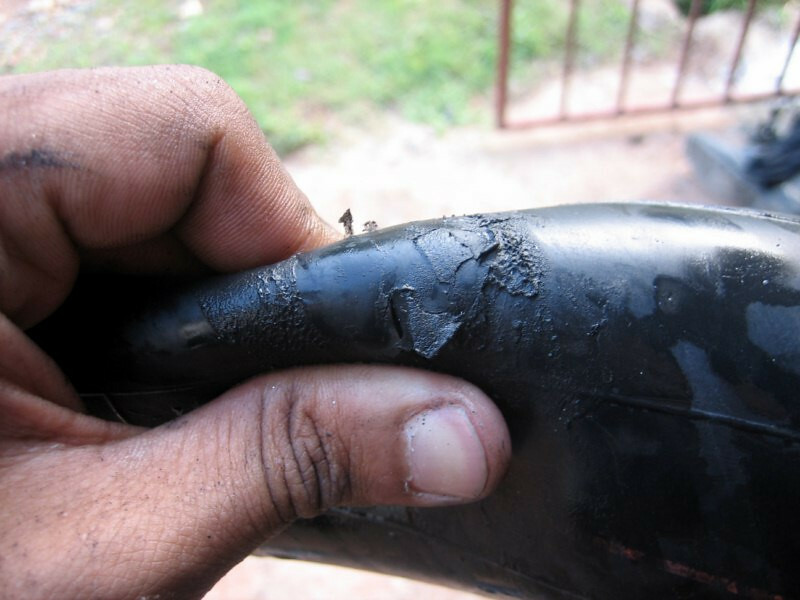 My ride back from Yaviza was exciting as I incurred another flat. I was slowly losing air in the rear tire after lunch and decided to just keep adding air and riding it to my destination for the night where I could work on it leisurely. This small nail was the culprit. I found it as it poked me; good thing for that tetanus shot. 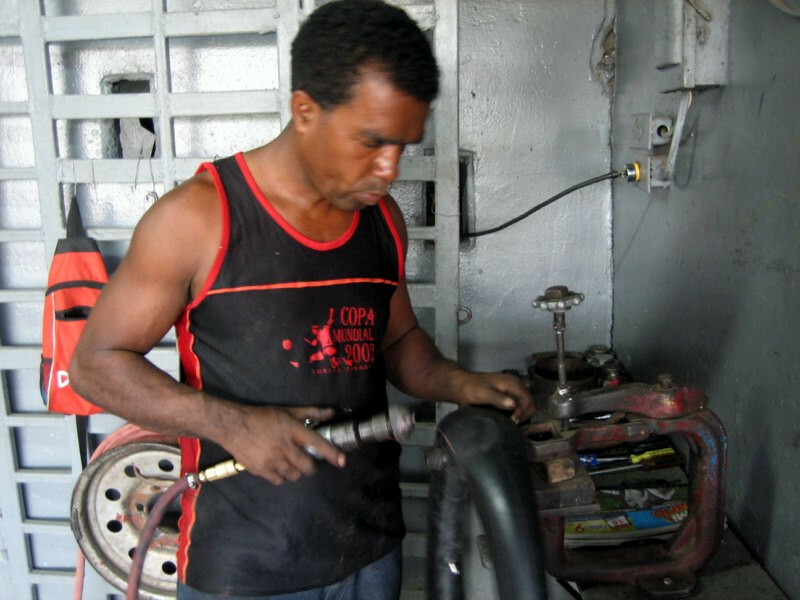 Having a nice place to work on it at the back of Posado Caledron in Chepo. Room cost $12 plus $3 for the bike. Using the Tyrepliers Beadbreaker successfully. It works well on one side and the other side usually requires a bit of wrangling with a tire iron to get the bead to break. 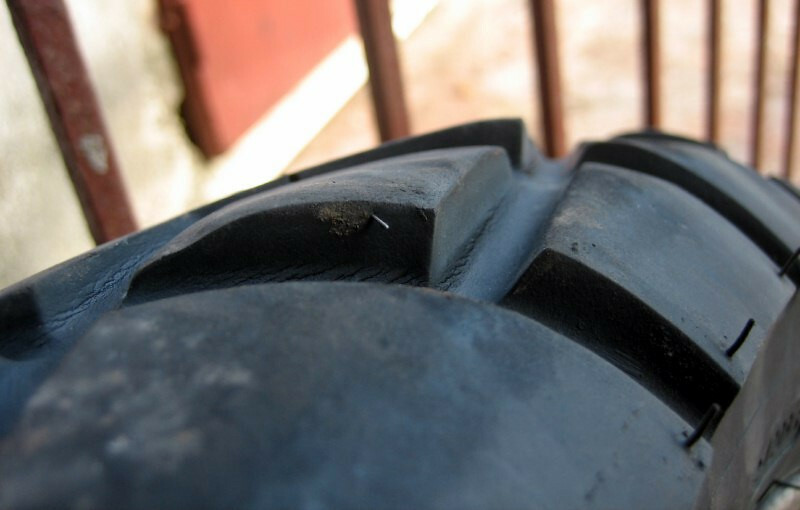 (The bead on a tire is the contact area that secures the rubber tire to the metal rim). 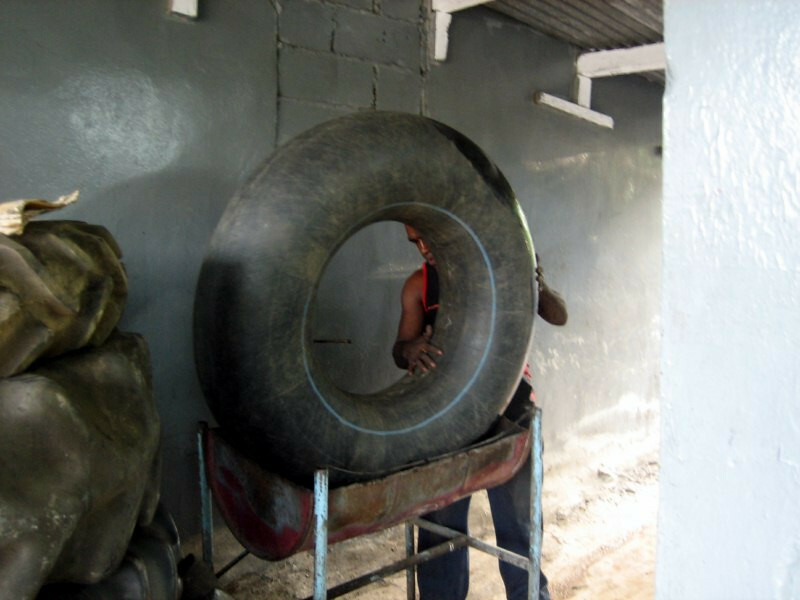 Three huge 15″ tire irons, making an easy job of getting the tire on and off the rim. 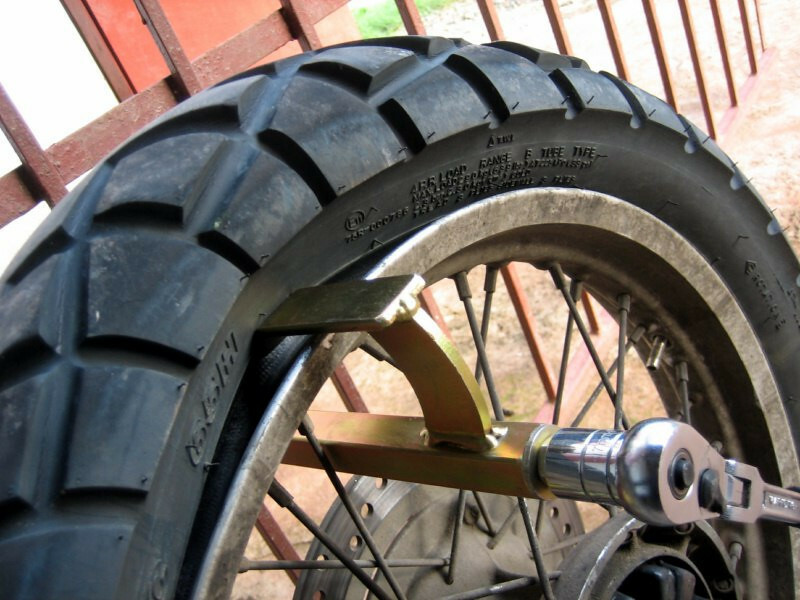 Not really easy, but much better than using standard smaller tire irons. What a coincidence that this new puncture was just about an inch away from my first puncture. 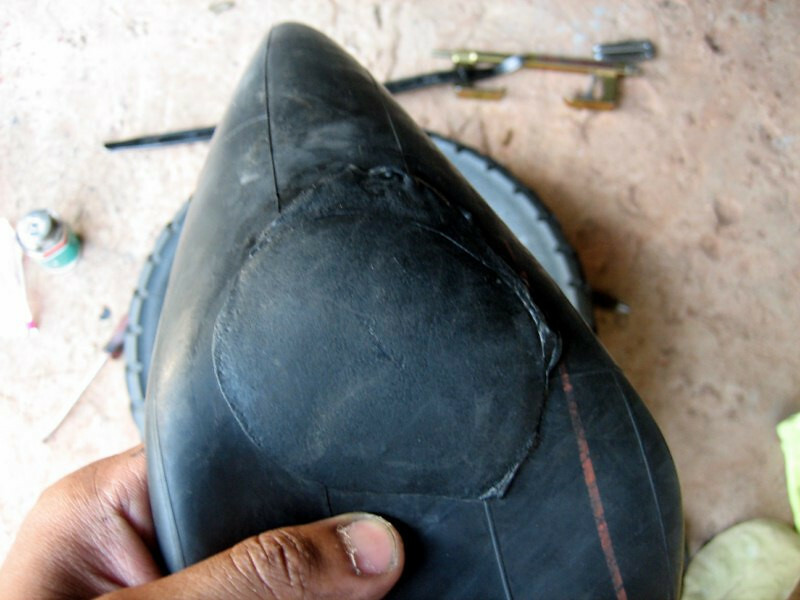 I thought at first that the patch on the first puncture had failed, but I found the angled gouge from the new nail. 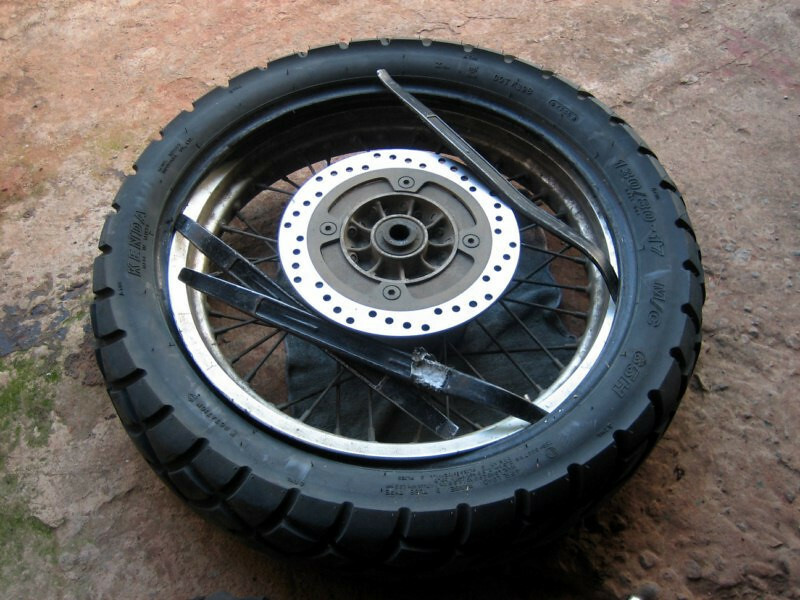 I had to remove the first patch and tried a larger patch to cover both punctures but the patch wasn’t sticking since I didn’t have the right tools to overcome the curvature of the heavy duty tube, so I walked over to the local tire mechanic and had him patch the tube. He’s grinding the area here. 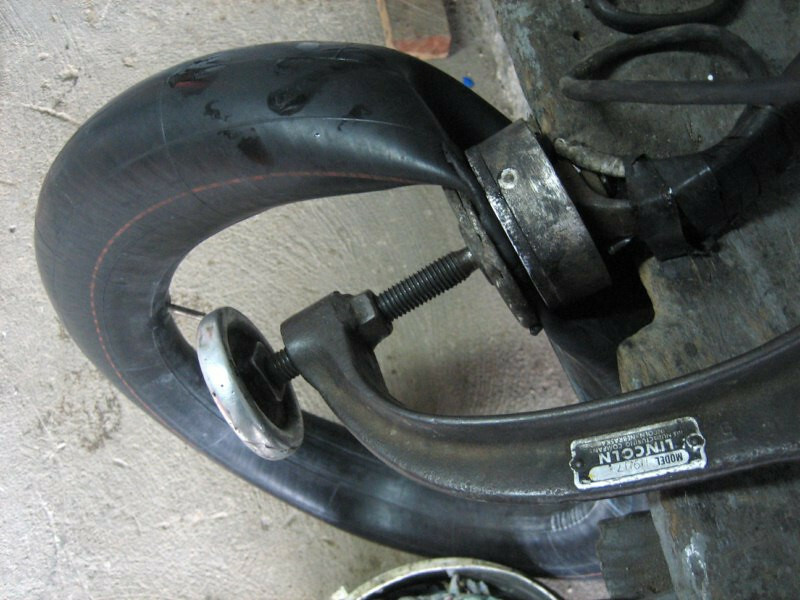 He applied hot vulcanizing rubber to cover both punctures and set it in this press to cure. While waiting, another customer came by for an inner tube for a truck. He’s running it through the water tub to check for leaks. Two hours later, tire is back on and ready to ride to Carti tomorrow to load onto the boat. 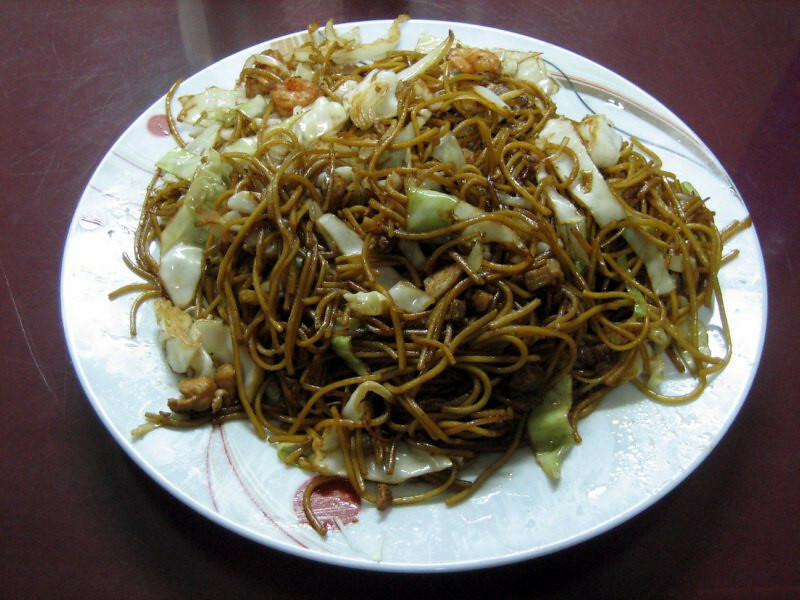 Enjoying a nice chowmein at the local Chinese restaurant for $2.50. Awesome stuff Jay. Again these are awesome pictures. Continue being safe and I look forward to more great stories and pictures soon. Nice pictures. 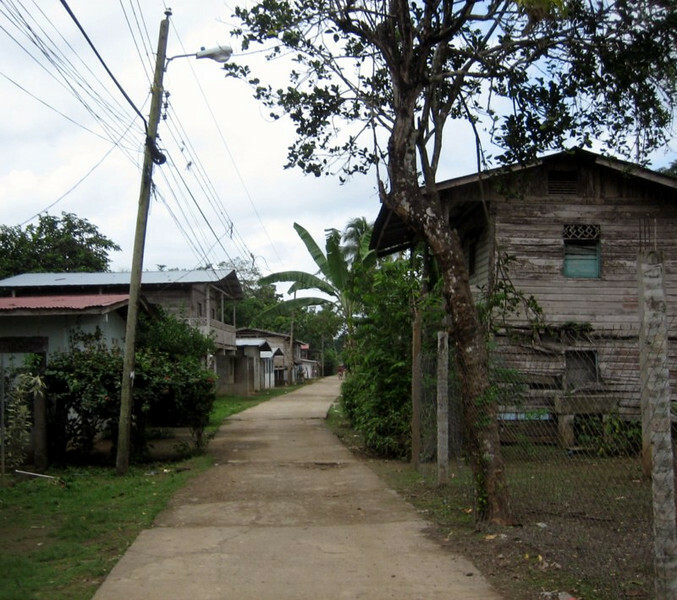 I lived in Panama for a few years, but never went further south (or east) of Tocumen. Would love to take a trip and venture into a the Darien just to explore. I doubt, I will be able to find anyone in my family who would also go with me. You don’t need your family to go down there. You can go by yourself 🙂 Explore the Darien! Problem with the radio show, not going to be on tonight. Will inform when I'll be on. Snapshot: Dawn at 35,000 ft; Air Travel is Too Fast!